This isn’t a bad little diagram of the four seasons along with the twelve zodiac names and symbols. However, it might be oriented wrong by convention or going clockwise instead of counter-clockwise. 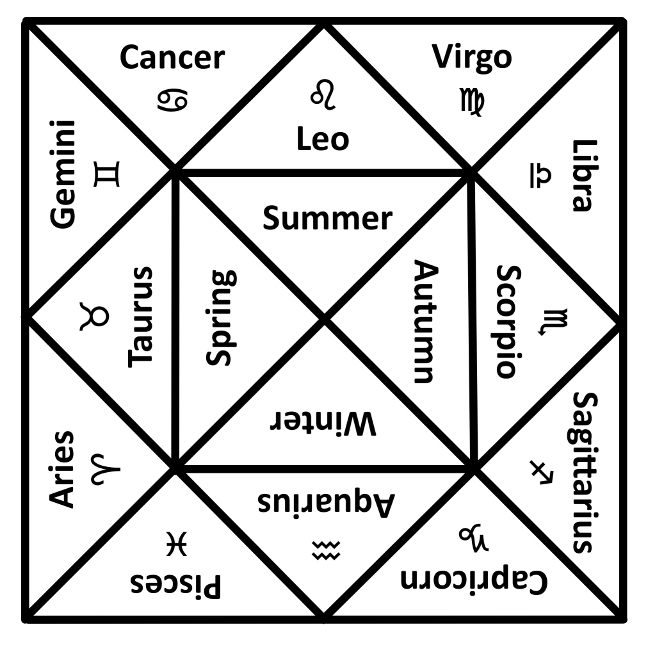 Interestingly, old horoscope charts that show what was in the sky (the positions of the zodiac stars and the eight or nine planets in regards to the twelve “astrological houses”) at the time of a person’s birth were shown using the outside ring of twelve triangles instead of the more familiar circle that is used today. The inner square might be for notes or some nice drawing. This entry was posted on August 22, 2018 at 3:19 PM and is filed under fourfolds, Occult, sixteenfolds, Space and Time. You can follow any responses to this entry through the RSS 2.0 feed. You can leave a response, or trackback from your own site.